The growing popularity of solar power has had another positive effect, beyond the obvious ones of feeding clean renewable energy into the grid and making a healthy return on investment, in that it’s helped the domestic solar job sector to soar, which in turn also helps to strengthen local economies. The National Solar Jobs Census 2014, the fifth in the annual series from the Solar Foundation, found that not only is the solar industry continuing to grow beyond expectations, but is also responsible for adding workers 20 times faster than the overall economy. In fact, the solar industry is behind 1.3% of all jobs created in the country during the last year, and over the past five years of growth, has added some 80,000 living wage jobs in the US. According to the Solar Foundation, as of November 2014, the solar industry employed more than 173,800 workers, which is a 21.8% increase since November 2013. That growth rate isn’t supposed to slack off in the near future, either, as the employers surveyed for the Census indicated that over the next year, they expect solar jobs to grow by over 20% again. It’s worth noting that approximately 157,500 out of the 173,807 solar workers in the United States are 100% dedicated to solar activities, so most solar employment isn’t just a side job or part time, and that most solar jobs pay wages competitive with similar industries, providing a living wage. Also noted in the National Solar Jobs Census 2014 is the fact that the single largest source of domestic employment growth was in installation, with the number of jobs in that sector doubling over the last four years, and that diversity in solar workers is increasing, with more minorities, women, and veterans finding employment in the solar industry. 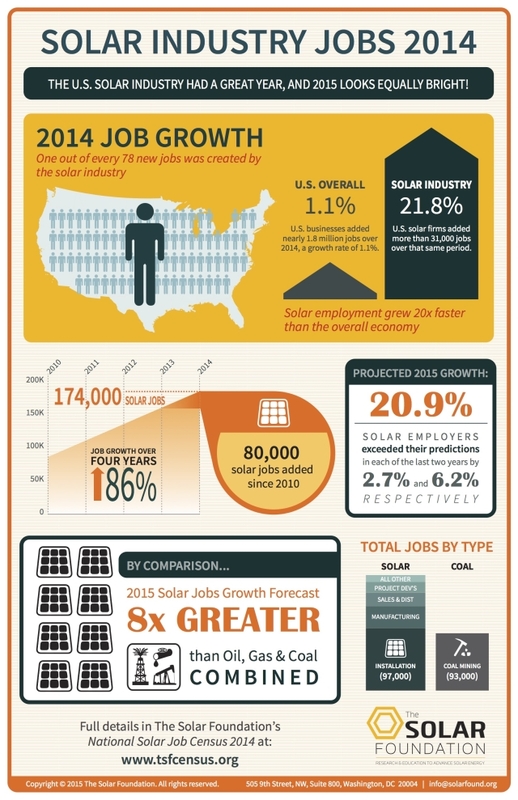 Read the full text of the National Solar Jobs Census 2014 at the Solar Foundation. Find out how you can be a part of the renewable energy revolution!